The aim of this study was to investigate the effects of robotic rehabilitation (RR) on spasticity and motor functions of children with varying types and functional levels of cerebral palsy (CP). A total of 28 children were evaluated aged 6-16 years, with level 2-4 CP according to the Gross Motor Function Classification System (GMFCS) who were planned to undergo 30 sessions of RR. 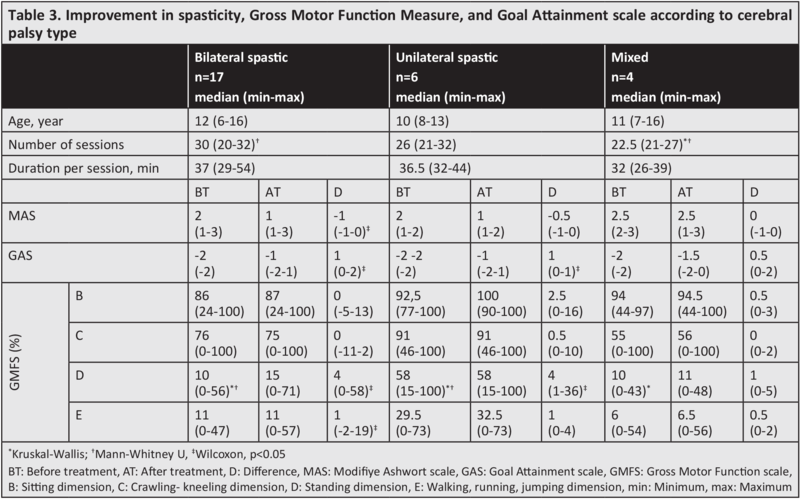 Motor functions were evaluated before and after RR using the Gross Motor Function scale-66 (GMFS-66) B, C, D and E dimensions, gastrosoleus spasticity with the Modified Ashworth scale (MAS) and a target was defined for each patient with a Goal Attainment scale (GAS). Following the RR treatment, the efficacy was evaluated by grouping the patients according to the GMFCS level and the type of CP. 11% of the patients were at level 2, 36% were at level 3, and 54% were at level 4.61% of them were identified as bilateral spastic, 21% unilateral spastic and 14% mixed type. The patients comprised 50% male and 50% female children with a mean age of 10.8±2.7 years. Mean participation in the RR program was 23±9.6 sessions. A statistically significant improvement was determined in the D dimension of the GMFS in the children at level 2 and 3 of GMFCS (p<0.05), and there were no differences in respect of the MAS and GAS (p>0.05). No differences were determined between the type of CP groups in respect of GMFS, MAS and GAS. It was concluded that the application of RR was of benefit for the children with CP at the level 2 and 3 of GMFCS in respect of the development of standing activities. One of the targets in cerebral palsy (CP) rehabilitation is to provide mobility according to the expectations of the patient, the clinical examination findings and patient characteristics. Therefore, in rehabilitation programs there has been increasing widespread use of robotic technology that has been developed with the aim of facilitating or correcting the gait, thereby providing functional walking (1-3). Robot-assisted gait training is based on the principles of sensorimotor learning. Through the intensive and repeated visual and auditory stimuli given in the different phases of walking, it is intended to regain functional ambulation (4). There is not yet considered to be sufficient information to be able to form recommendations for robot-assisted walking in CP childen (5,6). Some studies have reported that robot-assisted walking has provided an increase in gross motor skills, walking speed and resistance (4,7-13), and an increase in participation and performance of daily living activities (9,14). However, it has been claimed that there is a need for stronger evidence of the role and efficacy of robot-assisted walking in the clinical treatment of CP children (10,15). There have been seen to be conflicting results related to the efficacy of robot-assisted walking training in CP children at different motor functional levels (7,13,16). van Hedel et al. (7) reported developments in mobility and gross motor function in children of level 3 and 4 according to the Gross Motor Function Classification System (GMFCS), while there was no development in level 2 children. Borggraefe et al. (13) determined a greater development in gross motor function in level 1 and 2 children compared to those of level 3 and 4. In a study by Willoughby et al. (16) it was reported that gait training on a walking band was of more benefit to children who were more severely affected functionally. However, to the best of our knowledge, there has been no previous study that has investigated the efficacy of robotic rehabilitation (RR) in different types of CP. Therefore, the aim of this study was to evaluate the response to RR in terms of motor function development in children with different types and motor functional level of CP, who were planned to undergo robot-assisted walking training. The data of children with CP, aged 6-16 years, who applied to the outpatient clinic of physical therapy (PT) and rehabilitation department and who were eligible for RR were analysed retrospectively. The Ethics Committee of the University of Health Sciences, Antalya Training and Research Hospital approved the study (approvel number: 2015-029). A total of 30 sessions of RR was scheduled for the children with CP who were at GMFCS level 2-4, had received no botulinum toxin injections or surgical treatment within the previous 3 months, had sufficient mental function and did not have treatment-resistant epilepsy, any sight or hearing problem, contracture of the lower extremity, fracture or joint instability, hip dislocation or any circulation problems. 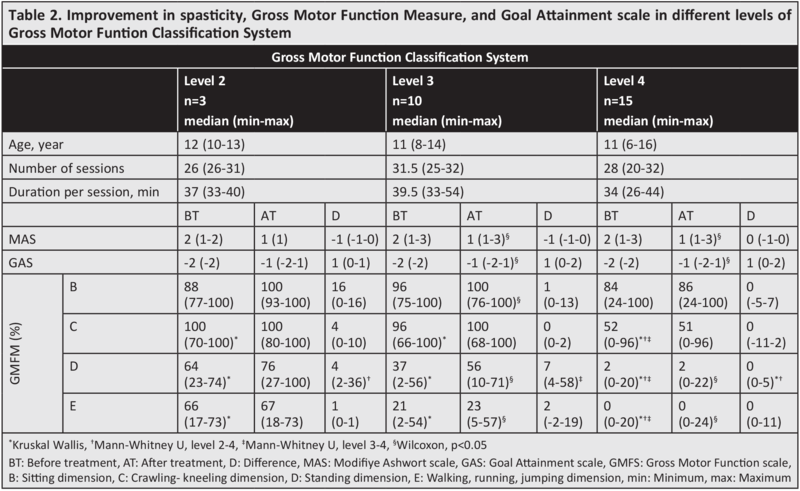 Motor functions were evaluated using the Gross Motor Function scale (GMFS), and gastrosoleus spasticity with the Modified Ashworth scale (MAS). Taking the GMFS results into consideration and using a Goal Attainment scale (GAS), a target was defined for each patient. All evaluations were performed twice, before and after RR, in all patients. The GMFCS is a standardised method that classifies gross motor function in CP Children into 5 levels: level 1, walking without restriction; level 2, walking with restriction; level 3, walking with a hand-held assistive device; level 4, limited independent movement and can use a motorised mobility device; level 5, moved by wheelchair (17). Classification according to the type of CP was made according to the Surveillance of Cerebral Palsy in Europe (SCPE) and was defined as bilateral spastic, unilateral spastic and mixed (18). Although there is no mixed type in the SCPE classification, the presence of spasticity and ataxia together was defined as mixed type. To measure the gross motor functions, the standard points of the GMFS were calculated. This scale comprises 66 items in 5 dimensions in terms of A, lying and turning (4 items); B, sitting (15 items); C, crawling-kneeling (10 items); D, standing (13 items); and E, walking, running, jumping (24 items) (19). In the study, lying and turning functions were not evaluated, so dimensions B, C, D and E were calculated for evaluation. The MAS was applied to classify gastrosoleus spasticity. Resistance to passive motion was measured on the following 5-point scale: 0) no increased resistance; 1) slightly increased reisitance; 2) clear resistance throughout most of the range of motion; 3) strong resistance, movement is difficult; 4) rigit flexion or extension (20). GAS is an individualized, goal-oriented measurement tool rated by the physician and patient to track functional improvement; scores ranged from –3 (worse than start) to +2 (much more than expected, improvements clearly exceeded the defined therapeutic goal) based on a 6-point scale. 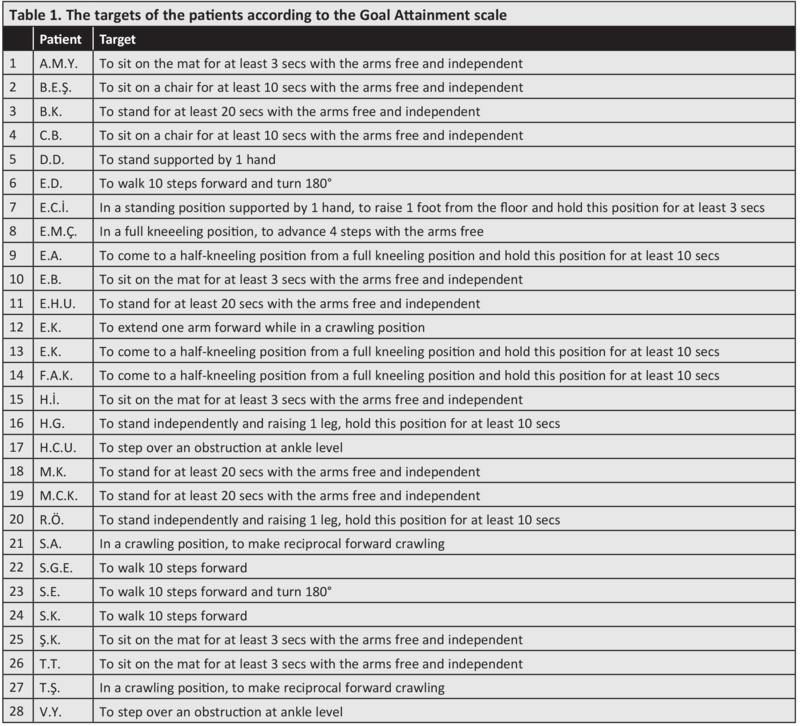 Active and/or passive goals were set for each child by the patient and the investigator at screening based on the GMFS results and the performance of the child (21) (Table 1). The RR application as performed 5 days per week, 40 min per session, 30 sessions in total with the RoboGait (BAMA Technology, Turkey) device, which is a robot-aided gait training system that helps the patients improve their walking abilities. The system was composed of a suspension system which could move the patient up and down, backwards and forwards, a screen providing feedback on the interaction of the patient and formed as a robotic walking orthosis providing active movements of the legs and the low-speed walking band on which the patient is walking. The robotic orthosis has motors providing active movement in the hip and knee joints and power sensors measuring the torque on the joints. All statistical analyses were applied using SPSS version 18.0 software. The differences in the GMFS, MAS and GAS data before and after treatment were calculated and values recorded as median, minimum and maximum. In the comparison of the gender distribution in the groups, the chi-square test was used, and for intra-group evaluations, the Wilcoxon test. The differences before and after RR were compared between groups using the Kruskal-Wallis test. For the comparison of significant data between groups, the Mann-Whitney U test was applied. A value of p<0.05 was accepted as statistically significant. The study included 28 children with CP; 14 males and 14 females. The GMFCS levels were 2 in 11%, 3 in 36% and 4 in 54%. All the GMFCS level 2 children were unilateral spastic, those at level 3 were 20% unilateral spastic, 70% bilateral spastic and 10% mixed type. Those at level 4 were 7% unilateral spastic, 7% dyskinetic, 67% bilateral spastic and 20% mixed type. The 1 child who was dyskinetic was not included in the statistical evaluation. The age and duration of each session were smilar in all patients when they were stratified according to the GMFCS or CP type (p>0.05). The number of RR sessions in the bilateral spastic group was greater than in the mixed group (p=0.031) (Tables 2, 3). At baseline, there were no differences between the GMFCS groups in respect of GMFS-B and MAS (p>0.05). A statistically sinificant difference was determined between the groups in respect of GMFS-C, (chi-square=11.770, p=0.003), GMFS-D, (chi-square=15.332, p<0.001), and GMFS-E (chi-square=17.138, p<0.001). The points of the level 2 children were higher than those of the level 3 and 4 children, and the points of the level 3 children were higher than those of level 4 (p<0.05) (Table 2). At baseline, there were no differences between the CP type groups in respect of GMFS-B, C and E points (p>0.05). The GMFS-D points were determined to be different between the groups (chi-square=7.805, p=0.020). No difference was determined between the bilateral spastic and the mixed group in respect of the GMFS-D points (p>0.05). The GMFS-D (standing) points of the unilateral spastic group were higher than those of the bilateral spastic group (p<0.05). In intra-group comparisons according to the GMFCS level, of before and after treatment, no significant differences were observed in the GMFCS level 2 children in respect of all the GMFS, MAS and GAS (p>0.05). In the GMFCS grade 3 children, no difference was determined in the GMFS-C points (p>0.05), however there were significant improvements in the GMFS-B, D and E values (z=-2.214, p=0.027; z=-2.812, p=0.005; z=-2.201, p=0.028, respectively) and in MAS and GAS (z=-2.530, p=0.011; z=-2.558, p=0.011, respectively). In the GMFCS level 4 children, GMFS-D and E dimensions (z=-2.032, p=0.042; z=-2.032, p=0.042, respectively) and MAS and GAS (z=-2.460, p=0.014; z=-2.714, p=0.007, respectively) improved significantly when compared to baseline values, but no significant difference was observed in values of GMFS-B and C dimensions (p<0.05) (Table 2). When intra-group comparisons were done according to the CP type, no significant change was observed after treatment in the bilateral spastic children in respect of the GMFS-B and C points (p>0.05), however there were significant improvements in D and E points (z=-2.821, p=0.005; z=-2.403, p=0.016, respectively), and MAS and GAS measurements (z=-3.217, p=0.001; z=-3.100, p=0.002, respectively). No significant change was observed in the unilateral spastic children in respect of the GMFS points, MAS and GAS (p>0.05). In the mixed type spastic children, no difference was determined in the GMFS-B, C and E points and MAS (p>0.05). A significant increase was determined in the GMFS-D points and in GAS (z=-2.207, p=0.027; z=-2.121, p=0.034, respectively) (Table 3). When inter-group comparisons were performed after the RR, no difference was determined between the GMFCS groups in respect of GAS, MAS and GMFS-B, C and E points (p>0.05), however, GMFS-D values were significantly different (chi-square=16.564, p<0.001). The increase in the GMFS-D points in the level 2 and level 3 children was greater than the increase in those at grade 4 (z=-2.214, p=0.027; z=-3.915, p<0.001, respectively) (Table 2). No statistically significant difference was determined between the CP type groups in respect of all the GMFS points, MAS and GAS (p>0.05) (Table 3). The aim of this study was to evaluate the response to RR in respect of motor function development in children with CP of different types and with different levels of motor function. At the end of treatment, while no change was observed in the GMFS points of the level 2 children, an increase was determined in the GMFS-B, D and E points of the level 3 children, and in the GMFS-D and E points of the level 4 children. No change was seen in MAS and GAS in level 2 children, whereas a decrease in MAS and an increase in GAS were seen in level 3 and level 4 children. In the group comparisons, the increase in the GMFS-D points of the level 2 and 3 children was greater than in the grade 4 children. There have been conflicting reports related to the efficacy of RR applied to children with CP at different gross motor function levels (7,13). van Hedel et al. (7) applied a mean of 20 RR sessions in addition to a regular physiotherapy program in a group of children with CP aged 4-20 years, comprising 15% level 2, 23% level 3, and 29% level 4. They reported that while there was no development in level 2 children, significant improvements were observed in GMFS-D and E points of level 3 and 4 children, without significant differences between the groups. Borggraefe et al. (13) applied 12 sessions of RR and determined a greater development in GMFS-D in level 1 and 2 children compared to those of level 3 and 4. In a study by Willoughby et al. (16), it was reported that the children with more functional disability were more likely to benefit from RR. In studies that have compared RR with conventional PT, different results have been reported in respect of efficacy (4,10,11,22,23). In a study which compared 20 sessions of RR and PT in bilateral spastic, level 2 children aged 8-10 years, improvement was recorded in the RR group in GMFS-D and E points (4). Another study found no difference between a PT group and an RR group in kinematics and step length, step width and walking speed measurement in level 2-3 CP children aged 6-13 years with spastic diplegia (10). Level 2-4, bilateral spastic CP children aged 4-12 years were compared as a hospitalised group applied with 20x45-min sessions of PT and an outpatient group applied with 12x60-min sessions of RR, and no difference was determined between the groups, with a similar increase in walking speed and GMFS-D points in both groups (11). In level 1-3, bilateral spastic CP children aged 4-17 years, treatment was applied for 4-10 weeks at a frequency of 4-10 sessions per week and no difference was determined between the RR, PT and PT+RR protocols. Similar results were determined to have been obtained from the robotic application and the physiotherapy, and it was concluded that a single application was more beneficial than combined applications, with reported improvements in GMFS-D and E points in all groups (22). In a study by Romei et al. (23), 20 sessions of RR and PT were compared with RR alone in bilateral spastic CP children, and it was reported that both groups improved and there was no difference between the groups in respect of the improvement in gross motor function. van Hedel et al. (7) determined a strong relationship between the GMFS-E dimension and the total number of treatment sessions in level 2 CP children. In that study, although not significant, the total number of RR sessions was higher, and the duration of the sessions was longer in grade 2 and 3 children. Despite the lack of studies directly comparing RR treatment doses, that children who were more affected in respect of motor function were likely to benefit more from the application of a greater total number of sessions and longer session duration (7). Researchers have emphasised that more severely impaired children benefit more from a greater number of sessions, and longer walking distance and duration of the sessions, while lesser affected children benefit from high intensity programs of shorter duration (24,25). In the current study, while no change was determined in GMFS points, MAS and GAS in unilateral spastic children, an increase was determined in GMFS-D and E and an improvement in MAS and GAS measurements in bilateral spastic children. In the mixed type children, an increase was determined in GMFS-D points and GAS. No difference was determined in the GMFS, MAS and GAS between the CP types. As there is no previous study in literature that has evaluated the efficacy of RR in different CP types, no comparison could be made. Although there was no difference between the CP types in respect of MAS, the MAS median value was found to be higher in the bilateral spastic and mixed type groups. The improvement in motor function in the bilateral spastic and mixed type groups can be considered to be due to a reduction in partial spasticity, associated with the negative effect of spasticity on gross motor function (26). It has been emphasised that for there to be benefits of robotic walking training in respect of improvements in walking speed, resistance and gross motor functions in children with CP, the program should be applied at a frequency of 4 days per week with sessions of at least 30 mins (30) and it has been stated that strong evidence is required to determine the role of robot-assisted walking in CP children (10,15). The primary limitation of the current study was the low sample size of different motor function grades and different CP types, and that there was no control group. Second is that the anthropometric details of the children and energy consumption were not recorded as it has been previously reported that anthropometric differences affect gait kinetics and motor behaviour (3). It has been emphasised that a reduction in energy consumption is related to a reduction in contractions of spastic muscles and a more effective gait pattern (3). A third limitation was that details could not be obtained of the reliable application of the RR as it was implemented at a different centre. In conclusion, although several methodological limitations prevent definite conclusions, a number of potential clinical implications emerge from this study. Our results showed that RR application is beneficial for improving standing activities in bilateral spastic children with CP at GMFCS level 2 and 3. Further prospective studies are needed to confirm these results in larger groups of patients to improve the evidence-based application of RR. Ethics Committee Approval: The Ethics Committee of the University of Health Sciences, Antalya Training and Research Hospital approved the study (approvel number: 2015-029). Informed Consent: As this was a resrospective study, there is no informed consent. Surgical and Medical Practices: M.B.F., N.F.T., T.Ç., H.A., Concept: N.F.T., C.M.A.Ç., Ş.K.D., Design: N.F.T., C.M.A.Ç., H.A., T.Ç., Data Collection or Processing: C.M.A.Ç., H.A., Ş.K.D., Analysis or Interpretation: M.B.F., N.F.T., Literature Search: T.Ç., Ş.K.D., Writing: M.B.F., N.F.T. Miguel Cruz A, Ríos Rincón AM, Rodríguez Dueñas WR, Quiroga Torres DA, Bohórquez-Heredia AF. What does the literature say about using robots on children with disabilities? Disabil Rehabil Assist Technol 2017; 12: 429-40. Wiart L, Rosychuk RJ, Wright FV. Evaluation of the effectiveness of robotic gait training and gait-focused physical therapy programs for children and youth with cerebral palsy: a mixed methods RCT. BMC Neurol 2016; 16: 86. Carvalho I, Pinto SM, Chagas DDV, Praxedes Dos Santos JL, de Sousa Oliveira T, Batista LA. Robotic gait training for individuals with cerebral palsy: A systematic review and meta-analysis. Arch Phys Med Rehabil 2017; 98: 2332-44. Wallard L, Dietrich G, Kerlirzin Y, Bredin J. Effect of robotic-assisted gait rehabilitation on dynamic equilibrium control in the gait of children with cerebral palsy. Gait Posture 2017; 60: 55-60. Lefmann S, Russo R, Hillier S. The effectiveness of robotic-assisted gait training for paediatric gait disorders: systematic review. J Neuroeng Rehabil 2017; 14: 1. Castelli E. Robotic movement therapy in cerebral palsy. Dev Med Child Neurol 2011; 53: 481.
van Hedel HJ, Meyer-Heim A, Rüsch-Bohtz C. Robot-assisted gait training might be beneficial for more severely affected children with cerebral palsy. Dev Neurorehabil 2016; 19: 410-5. Kurz MJ, Reelfs H. Taking steps towards improving the mobility of children with cerebral palsy. Dev Med Child Neurol 2014; 56: 1137-8. Schroeder AS, Von Kries R, Riedel C, Homburg M, Auffermann H, Blaschek A, et al. Patient-specific determinants of responsiveness to robot-enhanced treadmill therapy in children and adolescents with cerebral palsy. Dev Med Child Neurol 2014; 56: 1172-9. Drużbicki M, Rusek W, Snela S, Dudek J, Szczepanik M, Zak E, et al. Functional effects of robotic-assisted locomotor treadmill thearapy in children with cerebral palsy. J Rehabil Med 2013; 45: 358-63. Meyer-Heim A, Ammann-Reiffer C, Schmartz A, Schäfer J, Sennhauser FH, Heinen F, et al. Improvement of walking abilities after robotic-assisted locomotion training in children with cerebral palsy. Arch Dis Child 2009; 94: 615-20. Brütsch K, Koenig A, Zimmerli L, Mérillat-Koeneke S, Riener R, Jäncke L, et al. Virtual reality for enhancement of robot-assisted gait training in children with central gait disorders. J Rehabil Med 2011; 43: 493-9. Borggraefe I, Schaefer JS, Klaiber M, Dabrowski E, Ammann-Reiffer C, Knecht B, et al. Robotic-assisted treadmill therapy improves walking and standing performance in children and adolescents with cerebral palsy. Eur J Paediatr Neurol 2010; 14: 496-502. Schroeder AS, Homburg M, Warken B, Auffermann H, Koerte I, Berweck S, et al. Prospective controlled cohort study to evaluate changes of function, activity and participation in patients with bilateral spastic cerebral palsy after Robot-enhanced repetitive treadmill therapy. Eur J Paediatr Neurol 2014; 18: 502-10. Aurich-Schuler T, Warken B, Graser JV, Ulrich T, Borggraefe I, Heinen F, et al. Practical recommendations for robot-assisted treadmill therapy (Lokomat) in children with cerebral palsy: Indications, goal setting, and clinical ımplementation within the WHO-ICF Framework. Neuropediatrics 2015; 46: 248-60. Willoughby KL, Dodd KJ, Shields N. A systematic review of the effectiveness of treadmill training for children with cerebral palsy. Disabil Rehabil 2009; 31: 1971-9. Palisano R, Rosenbaum P, Walter S, Russell D, Wood E, Galuppi B. Development and reliability of a system to classify gross motor function in children with cerebral palsy. Dev Med Child Neurol 1997; 39: 214-23. No authors listed. Prevalence and characteristics of children with cerebral palsy in Europe. Dev Med Child Neurol 2002; 44: 633-40. Hanna SE, Bartlett DJ, Rivard LM, Russell DJ. Reference curves for the Gross Motor Function Measure: percentiles for clinical description and tracking over time among children with cerebral palsy. Phys Ther 2008; 88: 596-607. Bohannon RW, Smith MB. Interrater reliability of a modified Ashworth scale of muscle spasticity. Phys Ther 1987; 67: 206-7. King GA, McDougall J, Palisano RJ, Gritzan J, Tucker MA. Goal Attainment Scaling: its use use in evaluating pediatric therapy programs. Phys Occup Ther Pediatr 1999; 19: 31-52. Peri E, Turconi AC, Biffi E, Maghini C, Panzeri D, Morganti R, et al. Effects of dose and duration of robot-assisted gait training on walking ability of children affected by cerebral palsy. Technol Health Care 2017; 25: 671-81. Romei M, Montinaro A, Piccinini L, Maghini C, Germiniasi C, Bo I, et al. Efficacy of roboticassisted gait training compared with intensive task-oriented physiotherapy for children with cerebral palsy. Proceedings of the 4th IEEE RAS & EMBS International Conference; June 24, 2012, Rome, Italy; 2012.p.1890-4. Bower E, McLellan DL. Effect of increased exposure to physiotherapy on skill acquisition of children with cerebral palsy. Dev Med Child Neurol 1992; 34: 25-39. Bower E, Michell D, Burnett M, Campbell MJ, McLellan DL. Randomized controlled trial of physiotherapy in 56 children with cerebral palsy followed for 18 months. Dev Med Child Neurol 2001; 43: 4-15. Kim WH, Park EY. Causal relation between spasticity, strength, gross motor function, and functional outcome in children with cerebral palsy: a path analysis. Dev Med Child Neurol 2011; 53: 68-73.